Life has pleasantly surprised me again. But I think the only reason why, is because I have opened myself up to the possibility of surprise. A month ago, I wasn't ready to be in this place. I felt uprooted and out of sorts and just craving comfort through familiarity. But I've finally settled down, settled in, thus permitting myself to experience the out of the ordinary. It's been wonderful. Certain areas of my life are harder to give up some measure of control over than others, especially when I'm feeling insecure. I want to know I am being taken care of, and in a new situation, it can feel like the only person I can rely on is myself. It's something that's a constant work in progress, and has steadily been improving in recent months, but I still fall back into those tendencies sometimes, especially in unfamiliar scenarios. Recently though...I've allowed myself to let go and embrace the unexpected. And it's resulted in a very pleasant "crazy random happenstance", if you will. Man, this dinosaur sure loves desserts. To mirror the surprises of my life, and because, well, it was this month's Daring Baker's challenge. What a happy coincidence! I've been meaning to make a cake like this for a while, so I'm glad I had an excuse. I thought about making some sort of a design inside as the surprise, but it seemed too failure prone. That is typically the type of thing I am pretty terrible at doing. 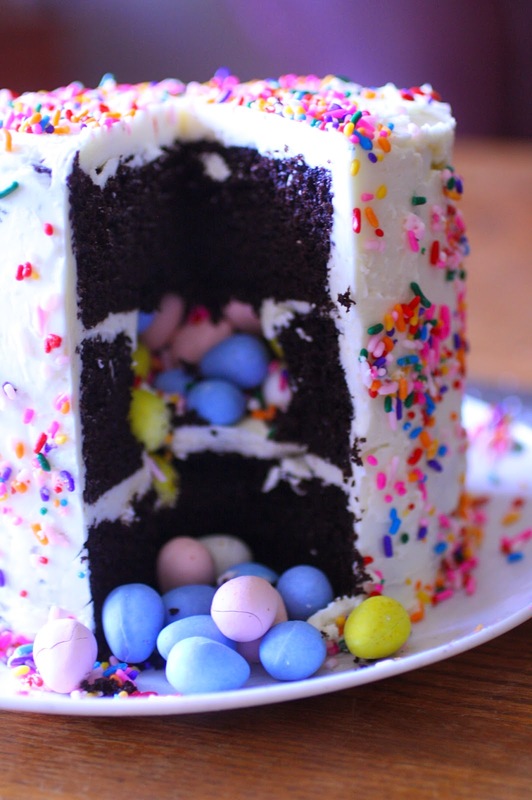 So I hollowed out a section of this devil's food cake, filled it with those tiny, delicious Cadbury eggs, and covered the whole thing in white chocolate buttercream and rainbow sprinkles to hide the ugly parts, haha. Hope you enjoy. Prepare to be surprised. Preheat oven to 325°F. In a large mixing bowl, sift together dry ingredients. Add oil, coffee and milk and mix at medium speed for 2 minutes. Add eggs and vanilla and beat 2 more minutes. Expect batter to be thin. Pour into three 6 inch pans and bake 30-45 minutes (I know it's a big range) or until a toothpick comes out clean. Cool completely before frosting. To make your cake a surprise inside cake, cut a 3-4 inch round out of your center layer. After frosting the first layer, put the second ring over it, fill the cake cavity, and proceed as usual. Put the egg whites in the bowl of an electric mixer. Melt the white chocolate about halfway in a double boiler. Remove from heat , stir until smooth , and set aside to cool. Combine the sugar and water in a small heavy saucepan. Set over medium heat and stir to dissolve the sugar. Bring to a boil and cook without stirring, until the syrup reaches the soft-ball stage 238 degree F on a candy thermometer. Immediately start beating the egg whites on medium low speed. Slowly add the syrup in a thin stream, taking care not to hit the beaters. Continue to whip until the mixture is body temperature and stuff meringue has formed. Reduced the speed to low and add the butter 2 to 3 tablespoons at a time. When the butter is incorporated, beat on medium speed until the frosting appears to curdle. Continue to whip and it will suddenly come together. Add the white chocolate and mix well. They are an excellent tool used to deceive people, haha. I am with the dinosaur on this one. Lovely cake.